Teradata Corp. (NYSE: TDC), a leading analytics solutions company, today announced important new deployment options for Teradata Aster Analytics, the world’s most advanced multi-genre analytics engine: Teradata Aster Analytics on Hadoop and Teradata Aster Analytics on Amazon Web Services (AWS). 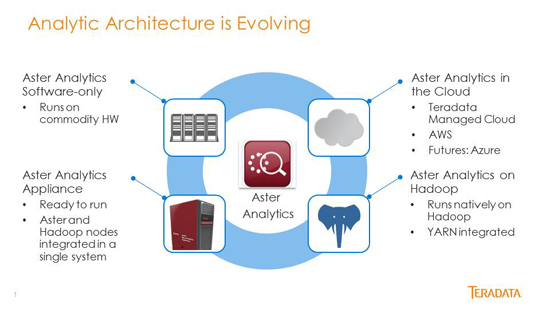 Although previous versions of Aster Analytics required dedicated systems, now companies have the flexibility to accelerate valuable analytic insight from their data wherever it resides, building on their existing investments in Hadoop. This flexibility supports Teradata’s strategy for a Hybrid Cloud architecture, the next generation of agility, flexibility, and integration between systems – and a more open approach to advanced analytics. Massive volumes of data from the Internet of Things (IoT), including sensors and digital mobile devices, have resulted in custom-tailored architecture that includes Hadoop and cloud. Teradata now provides significant options for a hybrid approach. "A core strength of Apache Hadoop is its extensibility and ability to embrace alternative analytic and processing engines. The addition of Teradata Aster Analytics to the industry's offerings is a genuine advancement and gives customers a powerful new choice for demanding analytic applications," said Mike Olson, Chief Strategy Officer and co-founder of Cloudera, Inc. Broadens the use and value of the Hadoop data lake - Aster Analytics makes Hadoop accessible to general business analysts with SQL and R skills. Aster supports more users across the analytic community. Runs natively in Hadoop - Rather than move data out of Hadoop into an analytic server, users can eliminate costs, delays and security risks associated with data movement and accelerate the process. Quickly operationalizes analytics in Hadoop - Users can instantiate development sandboxes and production environments on the same Hadoop cluster against the same data. In addition, Aster provides AppCenter to help analysts build web-based interfaces for business users. Speeds time to value - Businesses can quickly provision an analytic sandbox on the cloud and leverage Aster’s prebuilt SQL-based analytics to accelerate development. If the model demonstrates value, users can move the same analytics into “production” on the cloud. Boosts analytic agility - Provides the analyst with a powerful set of multi-genre analytics at scale to experiment and iterate on massive volumes of data for as long as they have the need. Provides financial incentives - Allows businesses to experiment with prebuilt advanced analytics functions and their data assets without the costs of new hardware, setup or implementation. Teradata Aster Analytics on Amazon Web Services will be available in mid-September, 2016. Teradata Aster Analytics on Hadoop 7.0 will be generally available in October 2016. For details on Teradata Aster Analytics on Hadoop, visit our web page. For details on Teradata Aster Analytics on Amazon Web Services, click here.